The Now Conda Binding is a more aggressive mid to stiff level binding that offers up a ton of shock absorption, a wider footbed than the first round and a very smooth ride. 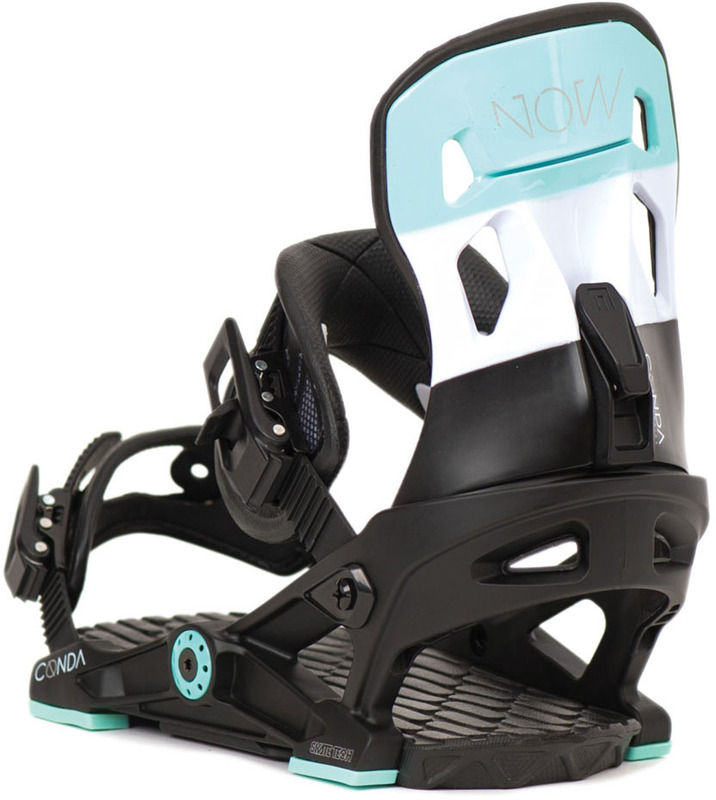 The NOW Conda’s have a customizable ankle strap for either a more flexible ride or a more aggressive ride. The High back is pre-rotated to 10 degrees only, so if you like to ride ducked out you may notice the high back on the back of your calf muscle because it has a stiffer flex to it. Other than that the NOW Conda makes for a fun aggressive all mountain binding that will deliver stability you need for charging down the hill. Highback Flex: 7/10 on the NOW rating. The high back offers great support, you can tell it is a more aggressive high back. If you ride it within the 10-12 degree realm it works awesome. If you prefer a more 15 degree plus ride you will probably get some calf bite. Boot Adjustability: The NOW Conda offers toolless adjustability for both straps, I found the adjusters to be kind of uncomfortable to use because of the shape of the plastic tab so it is hard to crank on if they are tight. Stance Width Adjustability: Other than not being able to adjust the high back rotation everything else is great. Comfort: The NOW Conda Bindings are super comfortable from the super damp footbed to the ankle and toe straps. Boot Support: The Asym Sieva ankle straps are great for giving you ample support for ankle flex but they are also very comfortable and spring back after you flex them. They also have a bigger side on the outside of your foot for more support that you can really feel. NOW added the FLIPit system so you can trade your ankle straps for a more freestyle or a more aggressive ride. The toe straps on the NOW Conda‘s are great, they cup the while front end of the boot with a softer type rubber and your boot stays right where you want it. Turn Initiation: Turning on NOW bindings is always a fun experience with their Skate Tech underfoot. It feels more like a skate truck than a snowboard binding and is supposed to help with foot fatigue by more efficiently transferring the energy right to the edges. Buttering: I wouldn’t get these bindings if you are really into buttering, they tend to make the board feel a little stiffer than it actually is. Ratchet System: The ratches work great with a quick release lever as well, a little sticky out of the box, but will probably smooth up with a little use. 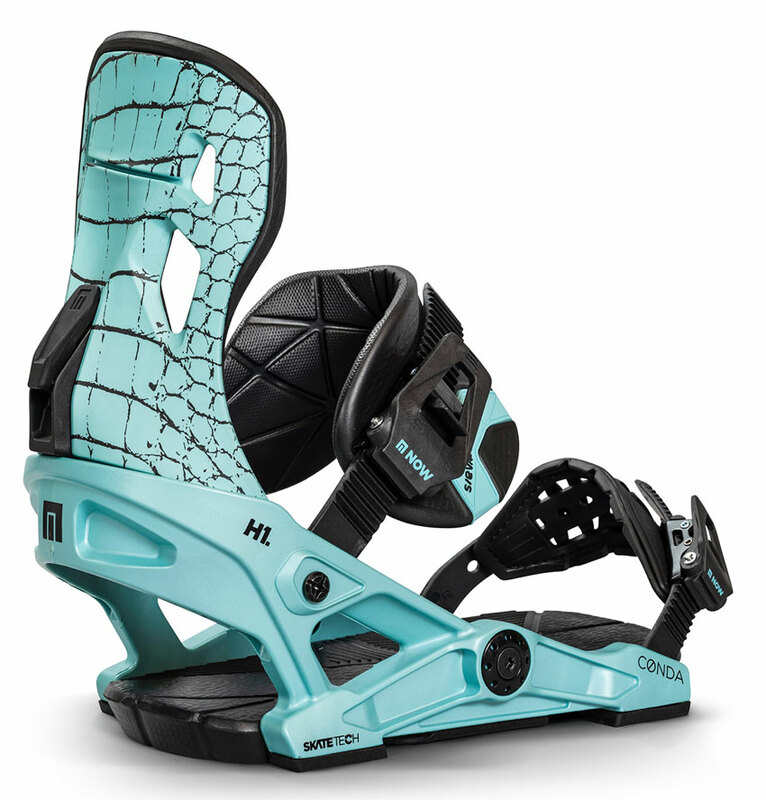 One of the best parts of this binding is the shock absorption, the NOW Conda Bindings are a really damp ride that helps you charge harder because all the chatter seems to be absorbed through the fat foam footbed. The Now Conda is a good mid level binding flex wise that offers up a ton of shock absorption, a wider footbed than the first round and a very smooth ride. It’s not very adjustable but other than that it’s worth a shot if you want a very damp smooth ride. Here is Steph’s take on them. We try to get as many images of the Now Conda, but forgive us if they're not all there.